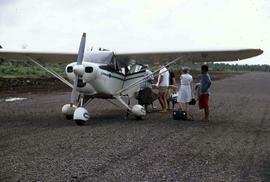 Colour Kodachrome 35mm slide depicts a group of people standing on a gravel runway either waiting to board or exit a small airplane. 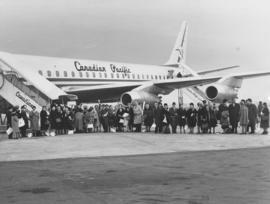 Photograph depicts a group of people preparing to board a Canadian Pacific jet. Colour Kodachrome 35mm slide depicts military personnel standing around a United States Navy airplane. Kodachrome 35mm slide depicts Phyliss Snider, on the left, and an unidentified woman standing in front of a small airplane, in Tanzania. Kodachrome 35mm slide depicts Phyliss Snider, two unidentified women, and an unidentified man standing in front of an airplane, in Africa.